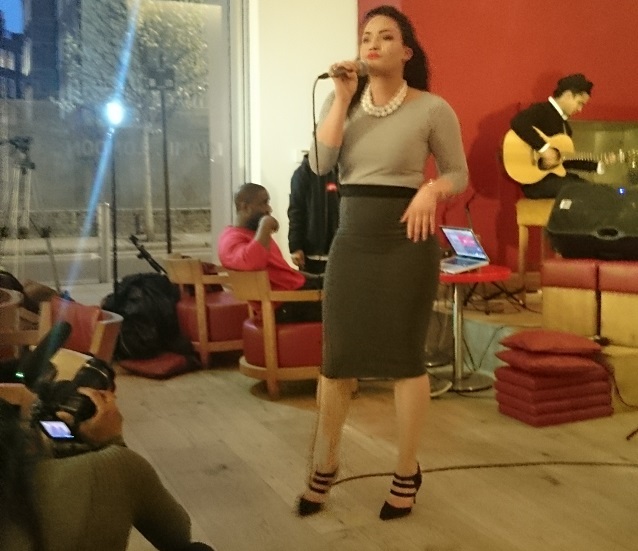 Vapiano is a different concept in a dinning. The idea behind Vapiano (which currently has three London branches, added to those around the globe) is to offer great quality Italian food, freshly prepared to order in a relaxed environment which is a million miles away from the overly charactured competitor chain restaurants. The twist comes when you come to order and pay. Instead of the usual systems of order and pay we’re used to. Upon entering Vapiano you will be given a swipe card. You give the card a swipe when ordering your food and drinks which are added to an account which you pay off at the end. Drinks are ordered either at the bar or through a waiter, either of which will swipe your card. You order each course, starter, mains, desserts, directly with the chef at different sections of a long wrap-around counter. There were stations for pasta, pizza and salad. 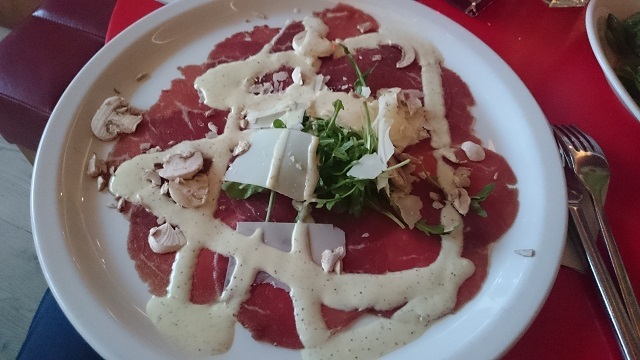 The beauty and simplicity of this is that you can personalise any of the dishes on the menu. 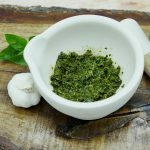 Don’t like some of the ingredients, leave them out or substitute them. It was also really nice to see the food being prepared in front of me. For pizza orders, which need to be cooked to order, you are given a buzzer which will alert you to your foods readiness. 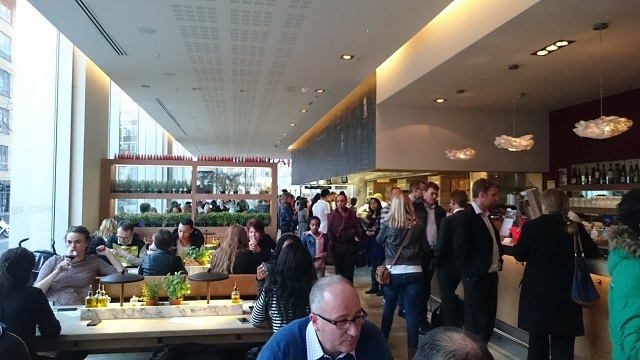 Vapiano, Southbank, is decorated in a simple elegant way which is strangely reminiscent of a canteen environment. It is split into two distinct areas. The front of the restaurant houses the serving counters, bar and long communal tables adorned with a variety of fresh herb plants. The rear half has smaller, more intimate tables as well as the performance area. 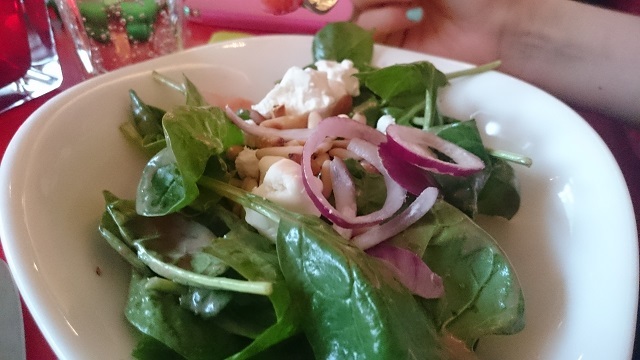 My partner ordered the strawberry and spinach salad which might sound an odd combination on paper but looked delicious. 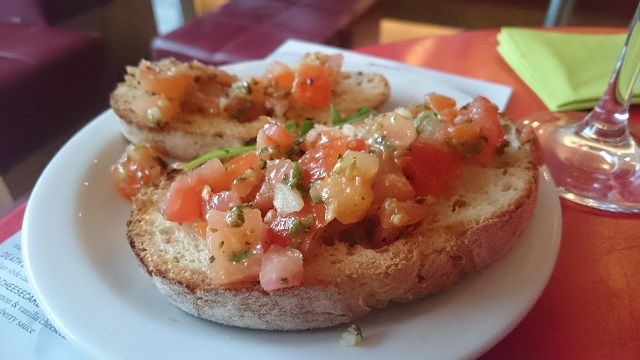 We also shared an order of bruschetta, just to be a little more greedy! For mains you have a choice of pasta or freshly made pizza. We both opted for pizza. 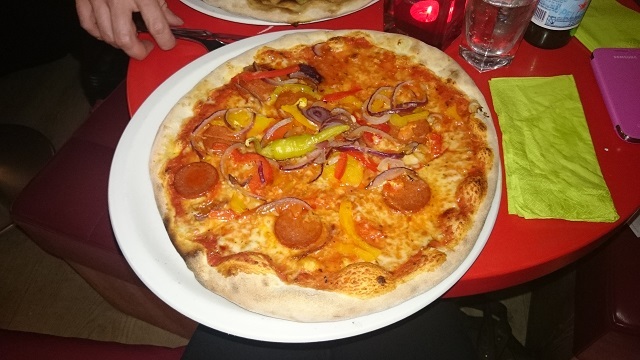 My partner chose the Diavolo pizza which is topped with spicy sausage, peppers, red onion, tomato sauce and mozzarella. She likes things a little spicy and this seemed to go down very well, despite more than filling the very large plate. I joined her in a pizza ordering the Dell’Alpe. This comes without a tomato sauce but instead has gorgonzola, Grana Padano, smoked cheese, dried tomatoes, rocket, mozzarella and figs. 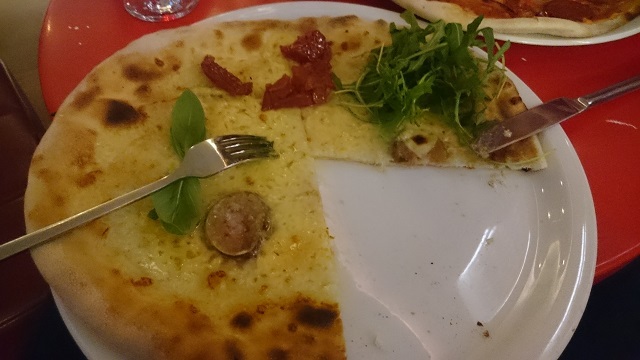 I hadn’t tried a white pizza before and really enjoyed this one. The figs were an especially lovely addition. We too full from our starters and mains to fit in a dessert but the do look delectable to say the least. I washed the meal down with a couple of glasses of Monte Schiavo Verdicchio Classico from the heart of the Marche region in Italy. The strong white wine has a great palate and fresh, zesty taste and aroma. This sounds heavenly.. both from the way it’s set up with live music as well as the food presentations. I love spinach and strawberries salad…. and the pizzas look heavenly!